The baby carrier with a built-in mini seat - introducing the i-angel Rainbow! The baby carrier with a built-in mini seat – introducing the i-angel Rainbow! We’re big fans of baby carriers here at Babyology, and we’re always scouting for options that boast the latest in research and design. So our eyes lit up when we spied this brilliant baby carrier, which is unlike anything we’ve seen. The i-angel is rather ingenious, as it has a built-in seat that ensures your baby is super comfy, and well supported. And that’s not all – come and find out what makes the i-angel hipseat carrier an absolute show-stopper. Baby carriers give parents so much freedom, all while comforting babies the best way we know how – by simply holding them. And they have come a long way, ergonomically speaking, for both wearer and baby. The i-angel baby carrier might best be described as the next generation in baby carriers, and really is at the cutting-edge of design. Basically, when in this carrier, your baby is on a mini seat. Sounds comfortable, right? That’s the aim – it’s supportive and ergonomic for baby to be seated, but this doesn’t mean the i-angel is a hefty carrier that weighs a tonne. It’s still really lightweight, while encouraging healthy hip positioning. The Rainbow carrier from i-angel is one of those clever products with three different functions. It can be used as a hip seat, a baby carrier and a hip seat carrier, growing with your baby, and changing with the wearer’s preference. Overall, the Rainbow is designed to give the wearer the optimal ergonomic carrying position, with a wide, padded waist belt and shoulder straps which are luxuriously padded. It means that the baby’s weight is evenly distributed so you’re not feeling the pull on your shoulders – rather, your natural weight-bearing hip area is taking the majority of the load. 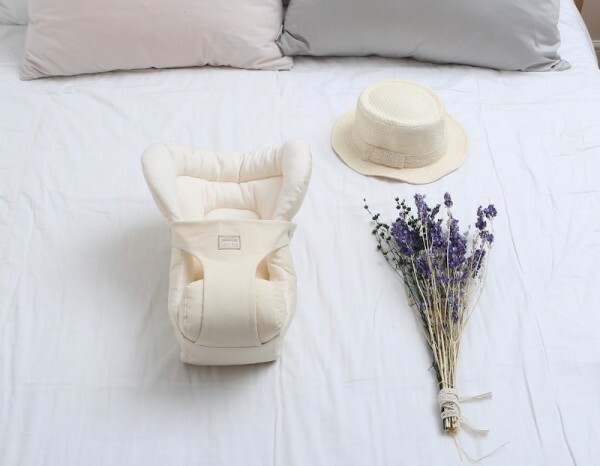 Now that you’re comfortable, we can take a look at how the i-angel Rainbow ensures baby is snug and happy. The hip seat pad allows the baby to remain in a frog-leg position, whether being carried on the wearer’s front or back. And this ingenious hip seat can also be used on its own to support your baby while breastfeeding, or simply while carrying your child in your arms. An incredible amount of thought has gone into the positioning of the hip seat; it sits at a 45 degree angle so that baby can listen to the heartbeat of the wearer. It creates a cocoon of warmth and comfort to soothe your baby, whether you’re out and about or just trying to get a fussy period under control at home. The i-angel designers have also made sure the Rainbow is a carrier for all seasons. In summer, the cover can be removed, leaving a mesh lining that’s lovely and cool. As the we head into the colder months, just pop the cover back on to keep your baby warm. The Rainbow also has a sleeping hood, and handy organic teething pads – because we know babies will find anything and everything to chew on! This carrier is made to grow with your baby, and can be used from birth with the addition of the Newborn Love Pad (pictured above). It is designed for babies up to 20 kilos, or around three years old, so it’s a sound investment. The i-angel Rainbow is available in a bunch of gorgeous designs, either online, or at stockists in Victoria.